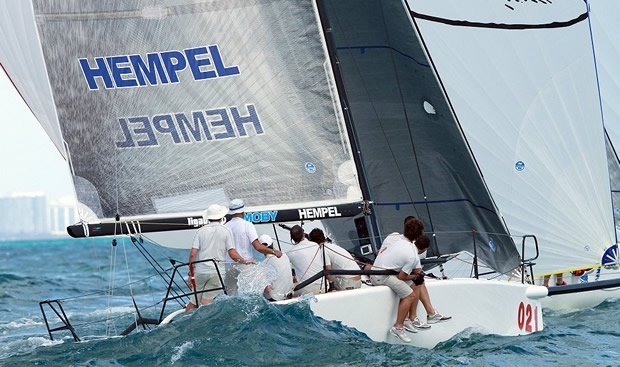 Day one at the 2012 Melges 32 Miami Championship delivered classic Miami conditions, as well as a steady stream of plentiful sunshine and warmth, setting the stage for three amazing races. Leading the overnight charge is Japan's Keisuke Suzuki on Swing. Jason Carroll's Argo is seated second and John Porter on Full Throttle is third. With his 'Good Winds' banner flying high above the course, Roberto Tomasini Grinover on Robertissima lashed out at the competition in the first race of the day, taking the right side upwind to round the weather mark in first. Carroll came on strong to round second, just ahead of Suzuki in third. As the three passed through the gate, they held position. For the final mark rounding, Grinover remained firmly in the lead, with Suzuki overtaking for second while Carroll slipped back to third. Mark Plaxton's INTAC rounded in fourth and Pieter Taselaar aboard Bliksem was fifth. Downwind, Suzuki remained determined to conquer the lead. Coming in strong and fast from the right, Suzuki snatched the victory rug right out from under Grinover a boat length ahead of the line to win. Grinover settled for second, Carroll came third. The second race of the day proved to be a great success for Vincenzo Onorato's Mascalzone Latino as he launched off the starting line to round the top mark in first with a substantial lead. Never once did he look back nor worry with contention from start to finish. Suzuki rounded in second, followed by Ryan DeVos' Volpe in third. Downwind, Onorato held on to the lead with Suzuki trying to chase him down. DeVos slipped to fourth giving up third to John Porter on Full Throttle at the gate. With Onorato extending his lead, Suzuki managed to hold onto second with DeVos reclaiming third. It wasn't long before the young DeVos put the ultimate moves on Suzuki grabbing second only moments from the finish. After one general recall and a solid start, PRO Hank Stuart fired off the third and final race of the day. Alec Cutler on Hedgehog took immediate command of the fleet at the top mark with Michael Dominguez's Bronco in second, and John Taylor's Ninkasi in third. Alex Jackson's Leenabarca was fourth, Porter rounded fifth, and Suzuki lurked in sixth. Downwind Cutler held the lead, with Dominguez rounding almost dead even through the gate. At the final mark, they held position with Suzuki moving up for third. It was a fight to the finish, with Suzuki coming from behind to take the lead from Cutler to win. Cutler settled for second and Dominguez took third. Three additional races are planned for Saturday.